"There is nothing more affectionate than a wet dog"
It wasn't raining today (makes a change :) ) So mum took us for a different kind of walk to our usual off lead romp we get. We went for a day out at a place called Conishead Priory, which is a buddist temple and college with lots of nice walks for us to go round. Theres an old estate house where we started and we took a path through all the woods, it looked very pretty with all the fallen leaves. We then came across a pet cemetery which mum thought was very sweet, but it was spooky to us, it is howloween after all! Now people say Great Danes aren't supposed to like the water that much, but I love it! Mum says it must be because we live at the seaside and both my brother and sister are bona fide water doggies, so I didn't really have a choice ;). Don't worry mum only lets us play with water logged stickies, so we won't hurt ourselves on them. We were very tied after our big swim and run...so we started walking back to the car, but on the way mum said she was hungry so we went to the little cafe the priory has, but because we were doggies we all had to sit out side with mum. I was getting a bit cold so my grandma lent me her jacket to warm me up, because she said she was too warm for it...i think i quite suit it, what do you think? People who walked past were commenting on how funny I looked, I didn't look funny at all, I thought I could start a new doggy fashion statement for this winter, I was certainly warm. It had no ears or legs, but me and Dante were brave doggies and weren't scared of it!!! But mum wanted to look inside the temple, so we had to be good doggies and wait with my mummys brother while she did! She hasn't take many photos but she took some in the garden today to celebrate my 6 month old 'birthday'. She said it feels like I've been with her FOREVER. I don't know if she means that in a good way or a bad way! We got some more 'family portraits' of us so she can see how much we are all changing...and we were being quite good at posing...although it took a lot of patients for mum to keep us all sitting pretty. ....then Daisy-Boo ruined a nice one by having a biiiiiiiig yawm! Hello everyone, Daisy Boo here. As you know we live near this amazing place called 'The Lake District' and its full of many beautiful walks, there's loads of mountains or 'fells' as they are known here and the name suggests, lots and lots of lakes! The fells are the ones in the background, picture from wikipedia. I had to wear my halti for the hike because there was loads of dangerous places for me to trip and fall, so my mum wanted complete control over me. I didn't mind though :) We found the remains of a very old miners house on the way up, it look like a 'carin' or a marker but it wasnt. Imagine how amazing it would have been to live and work up here? The slate mine is all but closed up here now. Mum made me pose by a little waterfall. I didn't want to pose I wanted to walk! Nope....more posing for me! We got right up to the waterfall, it was beautiful but very loud! I had a drink and the water was refreshing, but FREEZING!!!!! Heres a scary cave that was too dark to go down, so mum stuck her camera in a took a picture instead, isn't it spooky? She then naturally had to get one with me by the cave! Then even one of me walking! Phew! We had some biscuits and we were raring to go! We got to a place called levers water,which was so clear you could see right to the bottom. It started raining, but that didnt dampen our spirits, we had mountains to climb!! Until we couldn't see it anymore! The cloud base started to drop even further, so things got a bit chilly, but with all the walking we were doing we were warm enough. Mum made sure I was alright all the time, lots of biscuits for me and her to keep our energy up! We were over 1500ft above sea level at this point, and visibility wasn't so good, didn't stop me posing for a picture though, plus guess what we could see? The top!!! We couldnt wait to get up there and have a break and look at the amazing view...we were hoping the clouds would have cleared by then. But this is the only view we got before the clouds came back! Below is a Seathwaite Tarn, it was a loooong way down, I guess now I can see why I needed the Halti! It was so wild but beautiful at the same time, I was being a brave girl even though it was REALLY windy and there was a shear drop on the right to me! We walked for about half a mile along the ridge, then the cloud cleared long enough for us to see our next destination Dow Crag! It's 2552ft above sea level, another big climb for us. I fell in a boggy patch and got one paw dirty, mum found it hilarious, I didn't, how would she like one dirty foot?! The clouds cleared on the way down, so we got some nice photos of the fells! 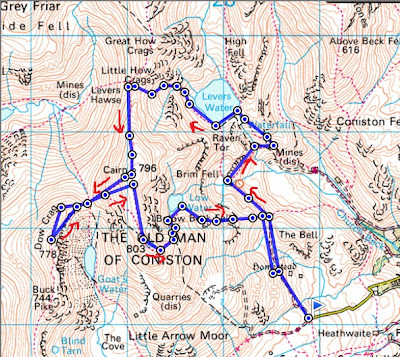 We then got a good look at our last climb, Coniston Old man, which is the highest in the range at 2634ft. Dow Crag, we had just climbed. It was getting cold so mum put my special 'snood' on to keep my delicate ears warm...I look stupid I know. I keeps me warm though, and my ears felt like they were about to fall off so I was glad for it! :) FINALLY we made it to the top of the Old man of Coniston! I felt very proud of my self. Mum made sure she got a photo of me and the Carin..the very top point of the mountain! It was good look that the clouds cleared when we got to the top so we had a nice view to sit and relax for a bit and watch, if you look below the water furthest away is the Levers Water, see how far we walked!? Below is Coniston town and Coniston water. Plus on the way down we got to see more of the disused slate mine, cool huh? When I got back to the car I had a deliscious meal of Tripe, Rice and Chicken and I slept all the way home and all last night, I was happy to see Dante and Sampson again though, mum says Sampson can come for a walk with us when he gets a bit bigger, but for now its just me with her on the hikes! :) Hope you enjoyed reading our adventure, it will be back to all three of us next time. Sitting Pretty and Feeling Better!